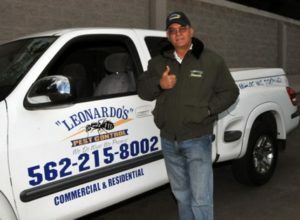 What makes Leonardo’s Pest Control stand apart from all the other pest control companies is that “WE ALWAYS DO WHAT WE PROMISE!” Not once, but ALL THE TIME! We at Leonardo’s Pest Control treat all varieties of insects, bed bugs, rodents, wildlife animals, etc. And like those other companies, we are certified and trained as required by law. For more details, please visit our Services Page. I am not sitting behind a desk, I am out in the field directing and supervising my technical staff, so I am sure it is done right, and my customers are 100% satisfied. Read what our customers are saying. © 2019 Leonardo's Pest Control. All Rights Reserved.